Paul and Jan, WIP, 11×14″ pastel on paper. ©Marie Marfia. This is coming along pretty well. At least, I’m pleased with it so far, although I’m carefully telling myself not to fall in love with it yet because that makes it more difficult to finish. 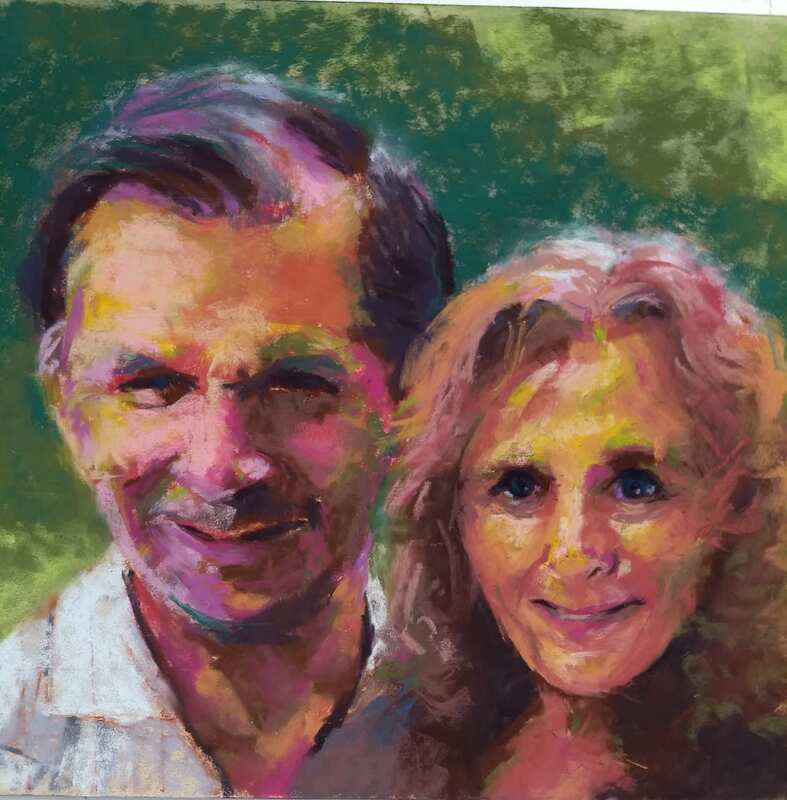 This is my second attempt at a portrait of my brother, Paul, and his wife, Jan. The first time the reference photo was just too low-resolution to work. I don’t like to get too detailed with my portraits but that doesn’t mean I can work without any detail at all. This year I brought my SLR camera to the reunion instead of relying on my phone and ended up with a much better photo selection. This portrait is based on two separate photos, one of Paul that I took and another one of Jan that someone else had taken at the same event. The photo of Jan showed her with her head tilted sideways and standing under a picnic shelter, so the light on her face was a lot different from the picture of Paul, who was sitting out in the sunshine. Thanks to Photoshop I was able to match the colors so that I could work from a reference that looked like they actually posed together. Hurray! Here are time-lapse videos of the progress on this portrait so far. Hopefully, I’ll have it done by next week’s email. Stay tuned! Hope to finish soon. Stay tuned! If you’d like to commission a portrait, please send me an email or give me a call, 904-566-4473. I love painting faces and yours (or someone you love) could be next on my easel! This entry was posted in A pastel a day, painting a day, Pastels, portraits and tagged commission, Marie Marfia, pastel, portrait, time-lapse on October 5, 2018 by Marie Marfia.